The North and South Bass trails are about 25 miles west of the main trails in a little used section of the park. The Bass trails were the first used in Grand Canyon for tourism and the Bass Rim to Rim route is the original Rim to Rim route in the canyon. In order to get to the trailhead, you will need an off-road vehicle that can get you to the trailhead. Expect to be driving on dirt roads for about 2 hours. This it allows for one night of camping on the North Rim before entering the canyon on the second day and one night of camping on the Colorado River at one of the major rapids in the canyon. Of course this itinerary features the amazing views that the canyon is famous for. As featured in Outside Magazine, the Grand Canyon Bass Rim to Rim backpacking trip is an original type of Grand Canyon adventure. On this itinerary, you will follow a Rim to Rim route that can only be achieved by paddling across the Colorado River in a pack raft. In addition to the regular backpacking gear, we outfit each member of the group with his or her own inflatable Alpacka raft, paddle and life vest that will be our transport across the Colorado River. The tour features Native American ruins, remains of old tourist camps, one of the cabins once visited by President Theodore Roosevelt and amazing views of the inner canyon in an area that few people reach when they visit the park. A version of this trip was also recently featured in the Chicago Tribune May 29, 2012. Check out the article and the video for some great detail and visuals of what you will get to experience with this trip. They didn’t carry packrafts so had to wait for someone to get them across! *Route Variation – your specific hiking route and campsites on each departure are dependent upon permit availability. This route requires a shuttle so you will need to be able to find some one to drop you off and pick you up. There are no commercial shuttle companies that have regular service to either of these trailheads. Need more information about the trails? Click the below links for the official North Bass and South Bass Trail descriptions from Grand Canyon National Park. It is best to spend the day driving as it is a long drive from Phoenix. Plus you have a couple hours of off-road driving until you reach the North Bass Trailhead. The drive is 7.5 hours from Phoenix-Metro and about 5.5 hours from Flagstaff. Once at the trailhead, you can camp the night on the rim and explore the area along the North Rim at Swamp Point. Swamp Point is a National Park designated camping area and must be reserved as part of your backpacking permit. Start your descent down the North Bass Trail. This is a steep and narrow trail, so the going is slow. There are three days to reach the river so there is no rush. The North Bass Trail is 13.5 miles (21.7km) long from the Rim to the River with a drop in elevation of 5,300 ft (1615.4m). The journey to the river takes the group past Teddy’s Cabin; along White and Shinumo Creeks, before reaching the beach campsites along the Colorado River downstream from Bass Rapids. 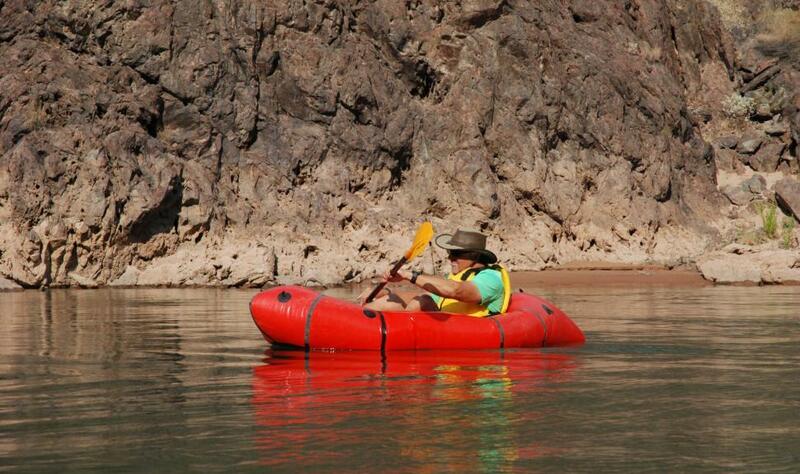 If you haven’t yet, today is the day to cross to the south side of the Colorado River via inflatable packrafts! And then begins he hike out of the canyon along South Bass Trail to the camp at the Esplanade. The distance from the river to the Esplanade is about 5 miles (8km) with a 3,150 ft (960m) elevation gain. Hiking time is about 4 to 5 hours and the group may spend some time hiking off-trail if time allows. On this day, there is a short 2.8 mile (4.5km) hike back to the top with a 1,250 ft. (380m) elevation gain. About half way to the top, you will pass by ancient Native American ruins that are tucked away up in the cliffs just yards off the trail. Once at the top, the you will have to travel along a 25 mile dirt road with some 4-wheel drive excitement as you drive back to Grand Canyon Village.